Google introduced free SMS service in GMail. When It was enabled they skipped two major services but a day later they enabled it for all the Mobile Operators in India. In the chat window, you can see a link Send SMS now. The service introduced in 50+ countries. The US and India includes all the operators. To prevent abuse the service. They are giving the 50 SMS and when you send one it will reduce one and If you get the reply then the limit will increase by 5. The reply comes back to the inbox. Once the credit hits zero. either you should get a reply to get 5 SMS credit or wait for 24 hours so the one sms will be added back. To prevent abuse, any Gmail user who sends an excessive number of SMS messages from Gmail, without getting any responses in return, will be blocked from sending further SMS messages. 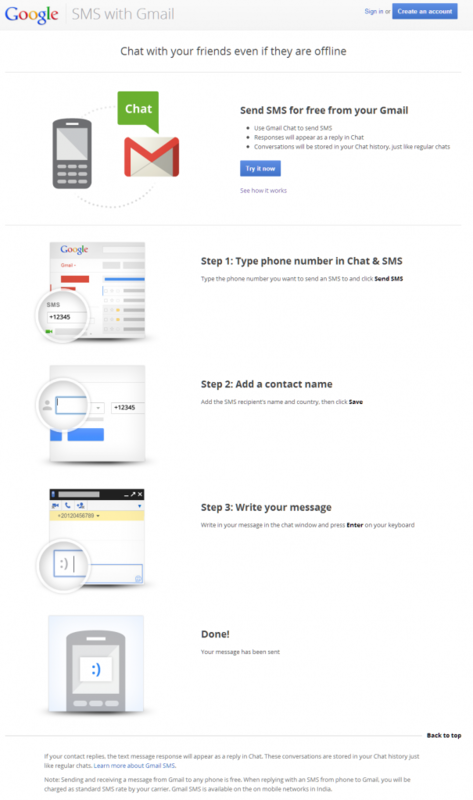 Google also provided the steps to send SMS.